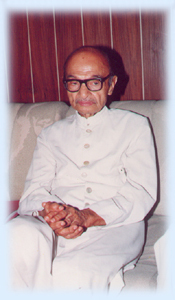 Late Janab Hakeem Abdul Hameed, a renowned physician, was the Founder-Chancellor of Jamia Hamdard, which he established with his own resources. A great philanthropist, thinker and visionary, he set up several institutions with the funds of Hamdard Wakf Laboratories. Some of the esteemed institutions established by him include Hamdard National Foundation, Hamdard Education Society, Hamdard Study Circle, Hamdard Public School, Hamdard Institute of Historical Research, Ghalib Academy, Centre for South Asian Studies and Business & Employment Bureau. He was honoured by several national and international awards including the Avicenna Award presented by the erstwhile USSR in 1983. He was conferred with Padma Shri and Padma Bhushan by the Government of India. He was also an honorary member of the Academy of Medical Science of the Islamic Republic of Iran and Chancellor of Aligarh Muslim University, Aligarh. In October 2000, the Research Centre for Islamic History, Art and Culture (IRCICA) Istanbul, Turkey, presented IRCICA Award for Patronage in Preservation of Cultural Heritage & Promotion of Scholarship to Hakeem Saheb posthumously. His noble vision was to bring happiness and growth to society through the development of education, services and health care. His motivating force has inspired Jamia Hamdard to successfully undertake multidimensional projects in the service of society.